Is your Facebook profile not visible to other users (and to you when logged out of Facebook account)? Instead of Facebook profile page, you see message: “This content is currently unavailable: The page you requested cannot be displayed right now. It may be temporarily unavailable, the link you clicked on may have expired, or you may not have permission to view this page.” This message is displayed when you have (unknowingly!) configured your Facebook profile to hide from search engines (and other Facebook users). To fix this issue, we need to change privacy settings of the Facebook account. Once we enable search engine access to the timeline profile, Facebook profile will start showing to other users. Ofcourse it will only display public information and all private contents will be hidden (if configured that way). Your profile will be visible showing profile name, profile photo and timeline cover photo. 1. 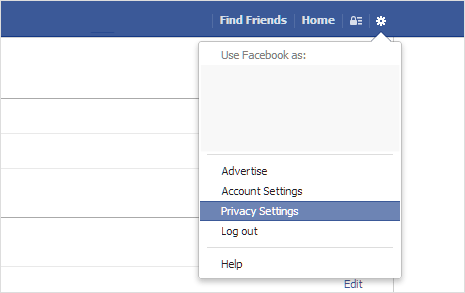 Once logged into Facebook, click Gear icon at top right and then click on Privacy Settings option. This will open Privacy Settings and Tools page where we need to make changes. 3. Click to check (tick) “Let other search engines link to your timeline” option and then click Close button. Your Facebook profile should become visible to other users ( and to you when logged out) in few minutes. Incase, you want to hide back your Facebook profile from all other users, just uncheck the search engine option above (changes may take some time).